Mesothelioma patients and their caregivers benefit from planning ahead for a medical emergency. Preparing medical documents and an emergency care kit in advance will ease stress and help you respond quickly if a medical emergency arises. 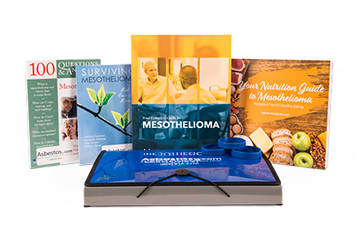 Complications of mesothelioma and its treatment can sometimes lead to medical emergencies. Problems may develop any time of day or night, and they usually happen suddenly. Getting prepared ahead of time can help patients and caregivers feel collected and ready to take action when a medical emergency happens. Ask your doctors for guidance about when you should go to the emergency room. They can tell you the signs and symptoms that warrant an ER visit. Signs of an emergency include a fever above 101 degrees, drastically worsening symptoms, severe and sudden chest pain or severe difficulty breathing. If symptoms such as these arise, it is better to be safe and get checked quickly than to hope you will feel better soon. If you’re participating in a clinical trial, ask your nurse or oncologist for a list of potential serious side effects to look out for. If you develop any signs of serious side effects, you should go to the ER immediately. For example, pleural mesothelioma survivor Jim McWhorter had to make an ER visit after starting a clinical trial because of a side effect called capillary leak syndrome. The first step to preparing your emergency plan is gathering all important medical information. Then, you can make a medical emergency kit with everything else you might need for an ER visit or overnight hospital stay. Oncologist information: Write down the name, address and phone number of your oncologist. The ER team may need to consult with your oncologist to confirm information about your diagnosis and treatment plan. Specific diagnosis: Note your exact diagnosis including your cancer’s location and cell type. A copy of your pathology report is helpful to include. Current medications, cancer treatments and side effects: Make a list of your current medications including prescriptions and over-the-counter medicines. Jot down the treatments you’ve received and any history of side effects you’ve experienced. Clinical trial information: ER doctors need to know if you’re participating in a clinical trial. Write down the identifying number of the clinical trial, where you are receiving treatment, what treatments are involved and contact information for those overseeing your care in the trial. Emergency contact information: Provide a list of important people to contact in the event of an emergency such as family members and the doctors who provide your health care. Include first and last names, addresses and phone numbers. Medical or legal documents: Print out copies of any living wills, health care proxies and advanced health care directives. Placing this information in a folder in your medical emergency kit will help you answer questions quickly and accurately in a crisis situation. Water and snacks: Include several bottles of water or at least two empty water bottles to refill. Have a few packaged snacks on hand in case the hospital kitchen is closed and no vending machines are nearby. Medical documents and supplies: Bring any helpful medical supplies including your medical documents, medicines, topical creams and medical devices. Entertainment: Plan to spend several hours of downtime in the ER. Bring abook, magazines, technology devices and a deck of cards or any games you like to play. Device chargers: Be sure to pack chargers for your cell phones and any other devices such as laptops and tablets. Spare cash or change: Vending machines often accept credit cards, but it doesn’t hurt to have some cash on hand if you run out of snacks and drinks. Toiletries and change of clothes: Medical emergencies sometime require an overnight stay at the hospital. Bring a change of clothes and essential toiletries. Little comforts like this help you feel more at ease. Your medical emergency kit can be as big or small as you want to make it. Some people opt for a streamlined kit that’s small and only includes the essentials. Others opt for a fuller kit that includes comforting and entertaining items as well. This kind of kit will also come in handy if a natural disaster strikes. Coping with a medical emergency is physically and emotionally challenging. Preparing as best you can in advance will help you respond well and process stress in healthier ways. Harvard Health Publishing. (2018, January). Are you prepared for a medical emergency? Raji, B. (2009). When Problems Can’t Wait: The Emergency Room and Cancer. Help for Cancer Caregivers. (n.d.) Emergency Preparedness. Hale, K.L. (2015, July). Emergency Care for Cancer Patients.